I have been ‘trolling’ amongst the museum photo collection again. 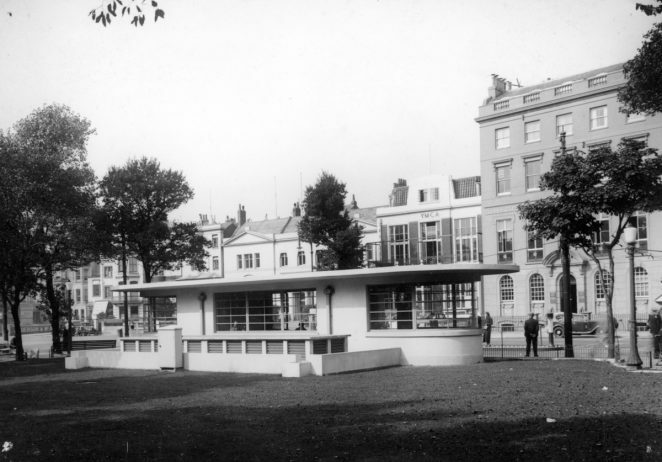 Thought you would like to be reminded of the Old Steine public lavatories pre-1999. It might seem strange publishing an image of a public lavatory, but I think this one was rather special. Monochrome photographic print showing the public lavatories in the Old Steine, Brighton, which were closed and converted into a cafe in 1999. The lavatory vents at the rear of the building were demolished. This view also shows the building on the right before balconies were added. I think you must be as strange as me Jennifer, I’ve been thinking about a new page “hidden public lavatories of Brighton and Hove”!!! There use to be so many when I was young and didn’t need them, now I am old and do need them, they have all disappeared!! I totally agree with you Peter – and what about public telephone boxes for when you forget your mobile! Your section idea is brilliant – you come up with the locations – we’ll do the pix. This originally was a tram shelter and toilet, the tram stop was in the middle of the road but there was little traffic when the trams ran so it was not a problem to leave the shelter to catch the tram. I believe it is now a listed building. I worked in Marlborough House (to the left of YMCA in the background) up until 1997 so remember these well. I assume the design was to mimic tram shelters as the area was and still is the main bus station area? This is a fascinating subject! I believe that the toilets and two bus shelters, further up the road, are in ‘Moderne’ style and may even have had preservation orders clapped on them. Is the one underneath the clock tower at the junction of West St and North St. still in use, or has that closed too? That’s closed Ken…about 30 years ago! The closure of so many public toilets is a disgrace. And most of those that are left are in a disgraceful condition. Not a good advert for a city that prides itself on being a premier tourist spot. The two public toilets I remember as a school boy were the ones at the bottom & at the top of Elm Grove. There was also a gents next to the bus stop at the end of Queens park Road. I think they were the outside toilets that belonged to the Racehorse Inn pub. I take it that the one near the peace statue at the Brighton and Hove boundary is also closed. I can remember on bonfire night when the toilets had and attendant lads use to throw bangers down they went of with a terrific sound in the enclosed space. Although I understand that there should be more public toilets, I am not sure that it is a tourist issue. Does anyone recall a punk-rock band recording a video in front of the urinals in the ‘gents’ underneath the clock tower? My toilet is nice and clean, unlike public ones. Brighton Council should be ashamed of the unhygienic mess that public conveniences are in. I’ve not used a public toilet in Brighton since I was a young boy. I walked into the toilets near the Palace Pier, and witnessed some ‘unwholesome’ activity. This subject has certainly aroused a passionate response! I think it’s the mark of a civilised society that its populous be provided with public lavatories. If gents’ toilets are being used for “unsavoury” purposes, then the provision of something along the lines of the French (pardon the expression) “pissoir” might be a good idea (open air urinals screened off). I believe that a form of them is in existence in some British towns. I spent many a happy evening down there in the late ’60s and early ’70s. Hours of fun! !